Maple blooms portend the arrival of spring for honeybees, yet I rarely (never) see a forager on maple blooms. Are maples getting credit for the pollen efforts of other early blooming plants or do I need stronger glasses? I finally took a close look at the maple tree in our backyard and it is just full of bees! Unless you really look hard you would not notice them-but they are there! I never realized so many bees visited this tree. Although I have seen a bee working the Maple blooms, I agree with the general theme of your post. I’ve never seen a mass of bees working the whole tree, like you do with hollies and some fruit trees. I wanted to also say that your talks at this year’s Spring Va Beekeepers Assoc mtg were incredible. I really enjoyed every one. You are a great speaker and a real joy to listen to. Thanks for all you do. I assume it was obvious that I had a great time at the VSBA event. All were in good spirits and the new location worked out very well. I sincerely appreciate your kind comments. Tinkering with humor with a large crowd can be deadly if it does not go right. Your members were in such good humor. I apologize for having to leave early. It was a long drive home. 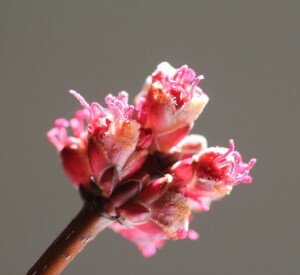 First, the picture describing a maple bloom is far from actually being in bloom. Early stages for sure. But nothing I would expect the bees to get excited about. I have a maple on the southern side of my house. It blooms out a week prior to anything else. (It’s all about root temperature) And the bees are all over it at times. Later when the rest of the many maples are blooming, the activity seems lower since there is so much to choose from. Maples even give off enough nectar that it can be managed for production if you do it right. This year, due to the several weeks of extreme warm weather, the colonies have even stored some excess nectar. Normally in most years this does not happen since the bees forage for a day, and then spend two days eating it back out with rainy or cold periods. Then forage a couple days, and then are stuck in the hive for a couple days. This year in Pa., they worked for at least a couple weeks straight. Normally it almost all goes to rearing brood. Those maples do more than what you give credit.